Jackson Davies, Ray Brown and Bruno Gerussi on The Beachcombers. The Canadian comedy drama aired on the CBC from 1972 to 1990. Photo courtesy of CBC. Calgary-based actor, writer and teacher. He runs Calgary Actors’ Studio and is ACTRA National Councillor for Southern Alberta. Steven Pinker is recognized as one of Canada’s greatest minds: Harvard University professor, author, international really smart guy. But in this case, Steven may be wrong. Or he will be. If everything unfolds as we hope. If To be or not to be is the most famous line ever written in English, the Mona Lisa is the most famous painting ever painted. Imagine taking a photo of the Mona Lisa and digitizing it; making it available for the world to see and enjoy! Yeah, I know; already is. Which begs the question: if you can examine the Mona Lisa in detail on your laptop right this second, why do legions of tourists and art lovers fly/drive/traipse to the Louvre every day to stand transfixed before this masterpiece? After all, they can’t even get as close in the Louvre as you can on your computer. And Leo’s actual painting is stuck behind bulletproof glass! What is it about an original anything that so captures our imagination? The greatest art and manuscripts are zealously kept and preserved. Even the not-so-great art and manuscripts are preserved. Heck: some really wretched art is lovingly preserved (an original of Dogs Playing Poker recently sold for U.S.$658,000). But the art from the 20th and 21st centuries is media. To paraphrase Marshall McLuhan, the “media” is the message, in Canada and around the world. And with all deference to Jean-Paul Riopelle, Emily Carr or Lawren Harris, painters already have their state-of-the-art museums and archives. But media artists don’t. Or we do, but it’s a hodgepodge admixture 100% at risk from anything and everything and hidden from sight. Nothing digital is immune to degradation. Digital does not equal original. Our history is sitting on celluloid and tape and degrading everyday if something isn’t done. The CBC project to digitize its entire archive was universally lauded... and then universally panned when we discovered the CBC planned to destroy the archive once it was digitized. Thankfully, ACTRA and a lot of other voices shouted loudly enough to get the CBC to hit a three-year pause button. Because nothing digital is immune to degradation. And digital does not equal original. Did you know that American film producers are now “preserving” digital movies by transferring everything to 35mm celluloid? Not for irony; for safekeeping. Cue the CBMF. The Canadian Broadcast Museum Foundation is “a not-for-profit charitable foundation working in the public interest to preserve Canada’s history, culture, and broadcasting heritage.” And Executive Director Kealy Wilkinson has a plan. And a place. Remember the good ol’ days of the Cold War? 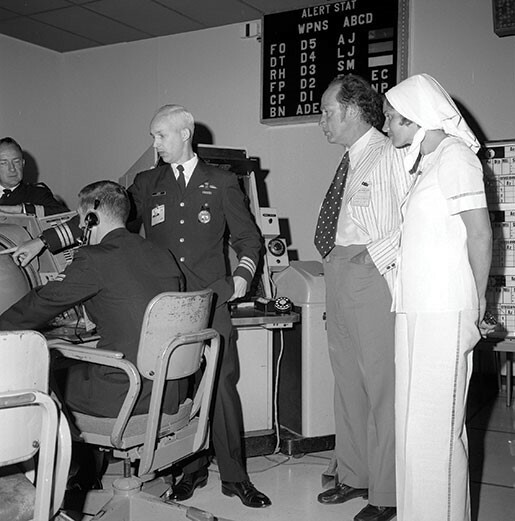 Sixty stories under the granite of North Bay, Ontario, is the former headquarters of the North American Aerospace Defense Command (NORAD), the U.S./Canadian installation created to protect North America from nuclear threat. Mothballed since 2006, “the hole” (as it was colloquially known) is possibly the safest, most secure spot on the planet. What better place to preserve everything from Uncle Chichimus and Glenn Gould (first broadcast on September 28, 1952) to Heartland (2007 and still going strong) and everything in between? With over six million cubic feet of storage, the estimated 1.5 million cubic feet the CBC requires right now would fit four times over and give Canada secure media storage for a very long time. Is it safe in terms of controls, temperature and magnetism (the enemy of “tape”)? The engineers are doing their assessment right now. Can a nation cross its collective fingers? 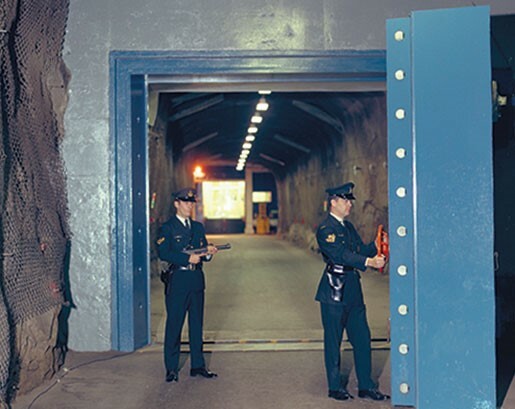 The 19-tonne blast door entrance to North Bay’s Cold War Nerve Centre. “You had everything you needed there. A barber shop, a gym, cafeteria and doctors’ offices. We assumed that if we had to stay there we could go three weeks or more without needing supplies,” states Marshall Swartz who was stationed at the underground complex three times. Even so: to paraphrase Canada’s longest-running TV Mountie, Jackson Davies – and if you don’t know who he is from The Beachcombers, this proves his point – if we can’t see it, what’s the point of storing it? Challenge #1: Preserve and protect our heritage. We may be there, or here’s hoping. Challenge #2: How the hell can we see it?